What is the best way to cover the seams in a manufactured home walls once the rounded strips have been removed? I did try the spackle/putty and tape routine without much success. Once the wall was painted, you could still see the area where the rounded strips were. The reason for the "zip strips" between the panelling are to leave the wall surfacing flexible - otherwise it cracks in transit to the "planting" site - this and weight and of course rapid construction with not curing times are the primary reasons drywall is not used in most manufactured homes. If you literally used spackle and/or putty, rather than drywall joint compound, that might be your problem. Typically, pros fill the joint with compound and move on to another area, then come back after it has set (not necessarily totally cured) and run another layer over the joint, tape it, and another layer of joint compound over that. Then let dry, sand, and 2-3 more coats oer the joint, each one wider than the first to taper it out. So, initial taping coats might be 4-5" knife, then 7-8 inch, then 10 inch, then 12-15" with sanding between each coat to get a truly tapered surface, which also totally covers the tape. Then prime - in the case of drywall joint compound and possibly a panelled surface (which should be sanded first to give it tooth), then entire wall would be primed to give a uniform base for the finish coats of paint. Inadequate number of taping coats leaves the tape exposed or very shallow, so the moisture from the paint cuases it to swell and fuzz up, leaving it highly visible. Also, failure to prime coat the compoundresultsin the paint soaking in more and gives a different surface texture. Normal joint applications - flat or rounded Tee strip like you had, hardwood trim molding over the joint, I have also seen automotive body filler used to provide a hard, rigid joint (after sanding) prior to recoating the entire surface, also fabric decorative strips over caulked seams - as well of course total overlay with panel products or T&G board. All of these solutions except for the Tee molding and nailed-on wood molding make it impossible to go back to the original surface of course because they permanently ruin the underlying surface beyond repair. Remove the wall strips.Use a drywall compound or similar substance and wall repair tape to hide the seam.Do the same to all or other parts of the wall if needed.Sand down the area to be consistent.Prime the area and the wall in order to paint, wallpaper, texture, etc. The actual shape and size of the wall strips might differ, but the steps to remove them will be similar. When removing the strips be careful that you don’t damage the wall panels.Watch out for sharp objects like nails or staples that might be lying around. Flat head screwdriver (optional) – You will use the screwdriver to loosen the wall strips. Putty/taping knife – This is for applying the solution to the wall. You can also use the knife to loosen the strips. Pliers/Hammer – You can use any one of these to remove the nails/tacks or staples from your wall after removing the wall strip. Wall repair tape or fiberglass mesh tape – It’s very important to support the compound with tape. Without this, the compound will inevitably crack over time as the panels bend. Here is a perfect example. Drywall/joint compound or spackle – For this purpose either the compound or spackle should serve just fine. You don’t need tape for spackle, but it is usually much more expensive than drywall compound even if you add the cost of tape. Both come in pre-mixed or powdered form and it’s really up to you which one you choose. If you have a vinyl wall you can also use acrylic caulk. You will have to use a primer before applying the caulk. It is more effective at hiding the crack than drywall compound if you have a vinyl wall. A few 5L-10L containers – You can mix your compound in here if you bought the powdered version. Some small containers – This is to keep the nails or staples from lying around where someone can step on them. Plastic sheet (optional) – Spread this beneath your work area to keep your floor clean. Ladder – Use this if your walls are higher than you can reach. Medium and fine grit sandpaper - The sandpaper is used to smooth the area of the compound or spackle to be consistent. Spread your plastic sheet below the area you intend to work. You can now bring in your compound or spackle and mix it inside without fear of spilling. Mix only as much compound as you can use in roughly 30min. After this, the compound will start to dry a little and might form blobs. Use the screwdriver/knife to work your way between the strip and wall and try to wedge it off. See which one works best and stick to it. Step 1 – Set up the ladder and start at the top. Try to wedge the screwdriver/knife in between the wall and strip. Pull the strip from the wall using a wedging action to loosen it. Try from both sides until you succeed. Step 2 – Move your way down the wall strip, loosening it wherever it doesn’t simply pull away from the wall right to the bottom. Step 3 – Carefully remove the wall strip. Take care to notice any loose nails or staples so you can collect them before someone gets hurt. 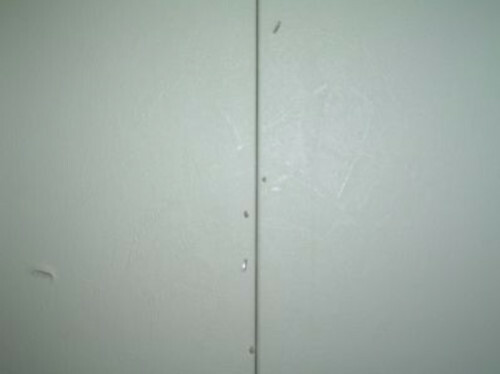 Step 4 – Depending on the way it was fastened, the nails or staples might be in the wall strip. Most likely they will still be on the wall. Step 5 – Once all the nails/staples are removed it’s time to clean the area using a cloth and some water. This doesn’t have to be thorough, just remove the loose dirt. If you have vinyl walls you can also use the medium grit sandpaper to roughen the area before applying the compound. If you have a vinyl wall and bought the acrylic caulk, skip steps 6 – 8. Step 6 – If you did not buy pre-mixed and have not done so yet, it’s time to mix the compound. You have to use it all shortly after mixing so be sure to only make enough for one wall strip at a time. Scrape some up with the taping knife and apply it to the seam and holes using almost a brushing motion. You can apply generously and roughly at first and then go over a second time to smooth it out. Step 7 – Take the tape and climb up the ladder. Starting at the top tape over the drywall right on top of the seam in a straight line. Then use the knife to flatten out the tape in the same brushing movements. Step 8 – If you are very worried about cracks or you are a perfectionist, then repeat step 6 and 7 until you are happy. 3-5 times should be enough. Watch this video to get an idea of how exactly it is done.Just ensure that your final layer is compound as tape and paint will cause problems. Step 9 – Wait for your compound to dry. Spackle should dry in a few hours whereas drywall compound could take 24 hours. After this, sand down the spackle using the medium grit and then the fine grit sandpaper. Try and get it as close your wall as possible without exposing the tape. Step 10 – This step is optional if you are not happy with the results. Some people just apply the compound to the whole wall and sand it down together. This is a lot of effort and might take a long time, but is probably the only way to achieve perfection. And there you have it! You have just taken care of your pesky wall strip issues and are well on your way to redesigning your walls any way you see fit. This is an excerpt of a larger post we did over on our blog. If you are interested, you can read it here. Again a really good question.